Sick of waiting for your smartphone to recharge? Israeli nanotechnology pioneer StoreDot Ltd just unveiled a groundbreaking new battery that can charge up in 30 seconds flat! The fast-charging battery incorporates “nano dots” derived from bio-organic material that offer increased electrode capacitance and electrolyte performance. This results in batteries that can be fully charged in seconds rather than hours. StoreDot Ltd unveiled their new batteries at Microsoft’s Think Next symposium in Tel Aviv. The startup claims that their product, which is inspired by nature, could make electronics more environmentally-friendly. The batteries aren’t expensive to produce, as nano dots originate naturally, and utilize a basic biological mechanism of self-assembly. The technology can be adapted to use a vast range of bio-organic raw materials making the entire process environmentally friendly and suitable for different applications. “The fast-charge battery is the result of our focus on commercializing the materials we have discovered. We’re particularly pleased that this innovative nanotechnology, inspired by nature, not only changes the rules of mobile device capabilities, but is also environmentally-friendly,” said Dr. Doron Myersdorf, CEO of StoreDot. The company says they have plans for mass production, and that nanotech technology could change the way portable electronics are produced. Some even hope that it could lead to the production of a fast-charging electric car. 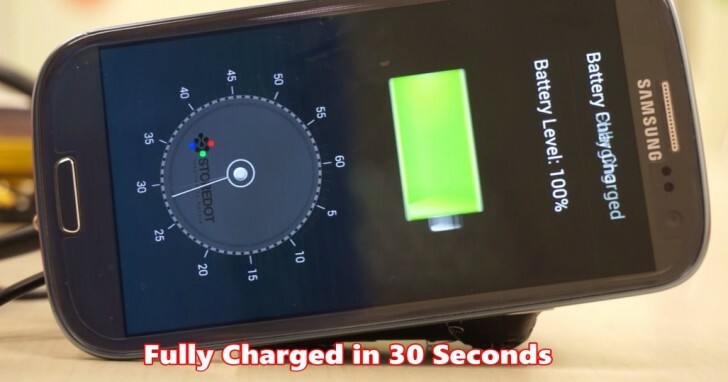 The nanodot technology means that a smartphone battery could be charged within 30 seconds. The technology could be used to create fast-charging electric cars.